Yucca Mountain may not be popular with Nevada officials, but in Nye County, it’s a different story. Photo by Daria Sokolova Michael Voegele, former chief scientist for Yucca Mountain, talked about the history of Yucca Mountain and why Nye County supports the project at the informational session on Nye County's relationship with Yucca Mountain at the Pahrump Valley Museum. Photo by Daria Sokolova Nye County Commission Chair Dan Schinhofen, one of the most vocal proponents of Yucca Mountain in Nye County, shows the Yucca Mountain exhibit at the Pahrump Valley Museum following a informational session about how Yucca Mountain came to be and why Nye County supports the project. Photo by Daria Sokolova From left to right: Nye County Commission Chair Dan Schinhofen, Nye County Nuclear Waste Office Director Darrell Lacy and Michael Voegele, former chief scientist for Yucca Mountain talk about how Yucca Mountain came to be and why Nye County supports the project. 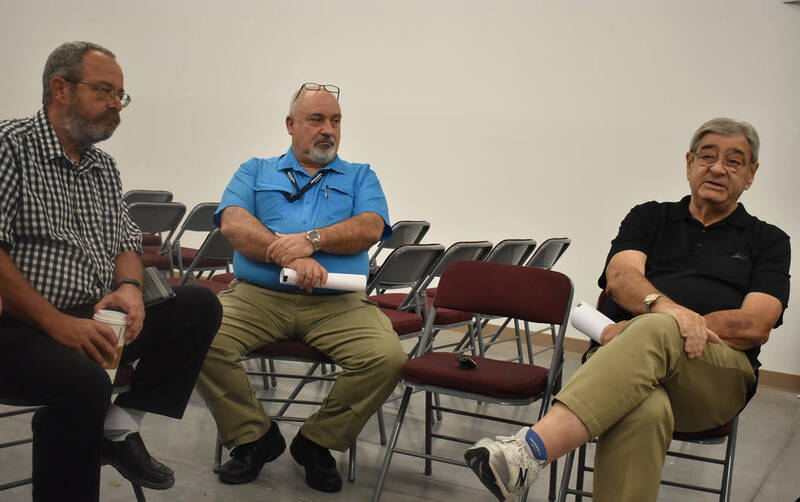 Special to the Pahrump Valley Times From left to right: Moderator Eric Knox, Nevada Agency for Nuclear Projects Executive Director Bob Halstead and Nye County Commission Chair at the panel "Yucca Mountain Restart" during the 2017 Radwaste Summit on Wednesday, Sept.6. 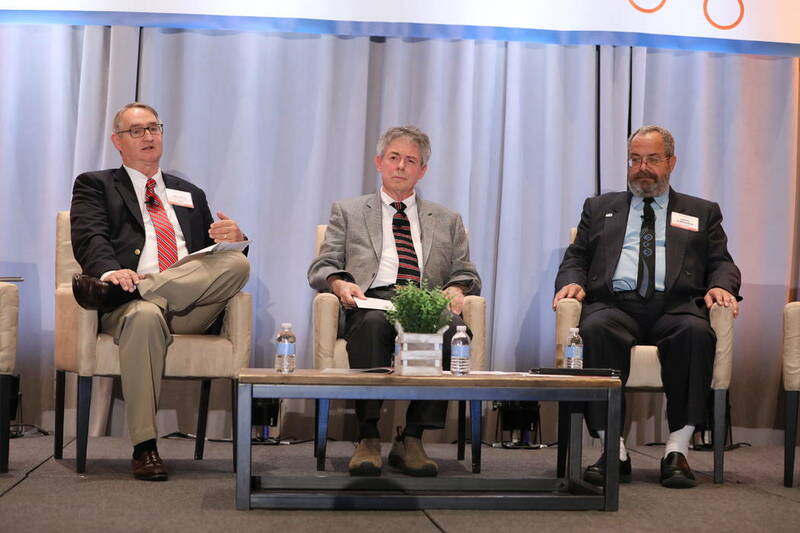 Special to the Pahrump Valley Times Nevada Agency for Nuclear Projects Executive Director Bob Halstead speaks during the panel "Yucca Mountain Restart" during the 2017 Radwaste Summit on Wednesday, Sept.6. 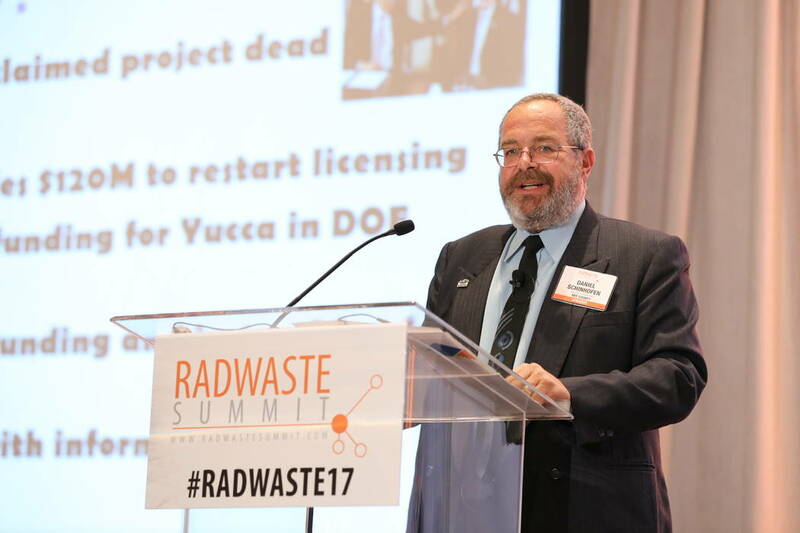 Special to the Pahrump Valley Times Nye County Commission Chair speaks during the panel "Yucca Mountain Restart" during the 2017 Radwaste Summit on Wednesday, Sept.6. 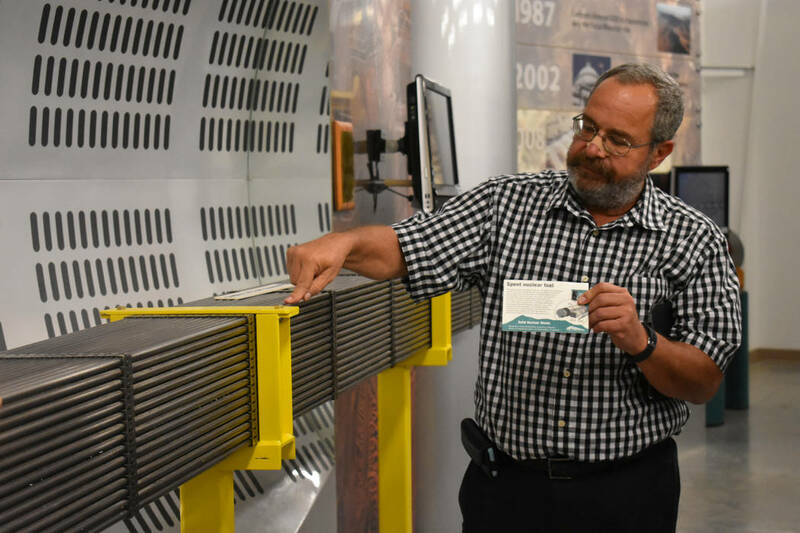 In the wake of a renewed battle for the future of Yucca Mountain between Washington, D.C., and the state of Nevada, officials in Pahrump held an informational session on how Nye County came to be the strongest supporter of the proposed nuclear waste repository in the state. Darrell Lacy, who has been heading the Nye County Nuclear Waste Project Office for the past 11 years, said he hasn’t found any “deal-killer” for Yucca Mountain. Dr. Michael Voegele, former chief scientist for Yucca Mountain, who had worked for 35 years on the project, spearheaded the event, launching into the history of Yucca Mountain with the narrative of how the 1987 Nuclear Waste Policy Amendments Act that designated Yucca Mountain as the only place to be studied for a repository. 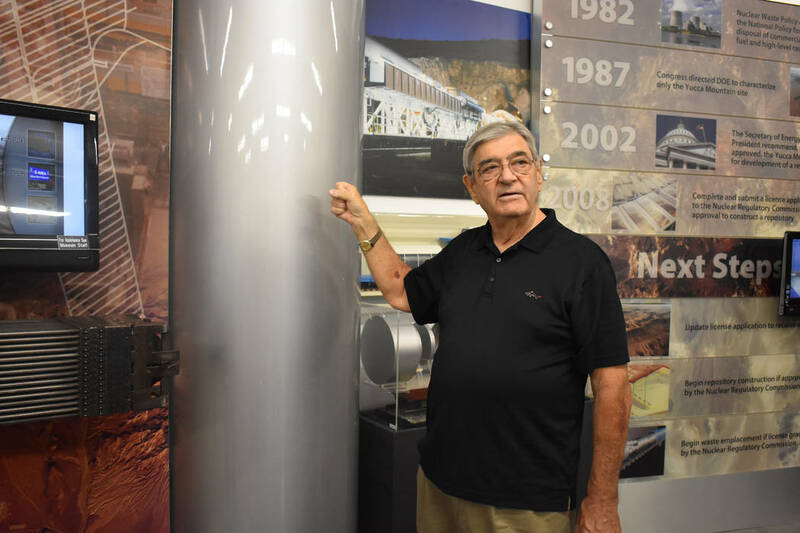 “That, frankly, was unfair,” Voegele told a small circle of local reporters and officials who gathered at the Pahrump Valley Museum on Friday. Under the 1982 Nuclear Waste Policy Act, the U.S. Department of Energy identified nine sites in six western states for the first repository, and 12 sites and 10 backup sites in the East and Midwest for the second repository. “We were coming up on the midterm elections, must have been ‘86, and quite frankly, politics started getting involved at that point in time. And the eastern states went to the Reagan White House and said, ‘we really don’t want you to come look into eastern states,’” Voegele said. Nevada, Texas, and Washington were selected for the first repository. When the law was changed by Congress, Jim Wright of Texas was serving as the speaker of the U.S. House, and Tom Foley of Washington was the House majority leader. “I’m never going to tell you it was fair, I can’t tell you it was wrong because somehow, they got the right site,” Voegele said. Contrary to some assertions that Yucca Mountain was selected on a political basis, Voegele said that the site was chosen primarily because of its unsaturated zone. “The science of Yucca Mountain is actually on one hand very complex, on the other hand, very simple,” Voegele said. The geology at Yucca Mountain resembles a sponge holding a drop of water from falling through, Voegele said. As of today, Nye is the only county in Nevada among nine affected units of local government that include eight counties in Nevada and Inyo County in California that studied Yucca Mountain. 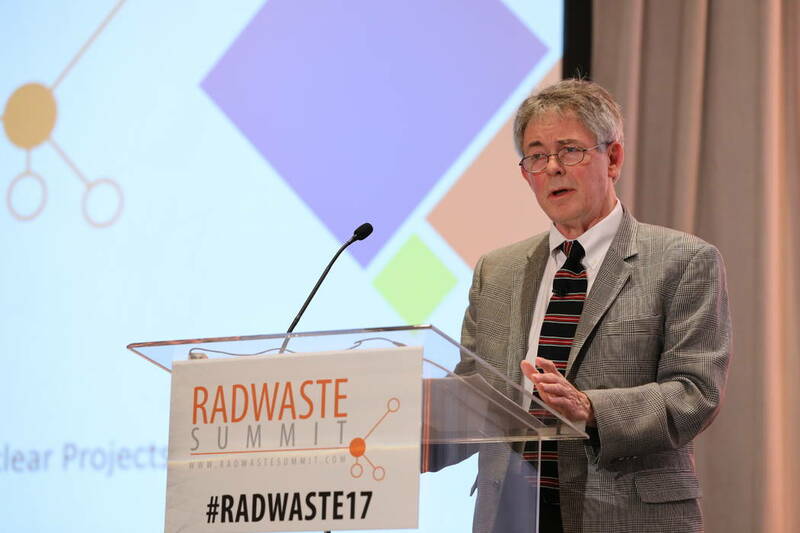 Nye County Commission Chairman Dan Schinhofen most recently spoke on behalf of the county at the 17th annual RadWaste Summit in Summerlin, where he called for the science to be heard. The Nuclear Regulatory Commission, the agency charged with the licensing of Yucca Mountain, echoed Nye County’s sentiments. In the five-volume Safety Evaluation Report, the commission contended that a proposed repository can safely operate for a million years, a point that’s often disputed by the state of Nevada. Voegele said the state of Nevada so far hasn’t been able to prove that the science of Yucca Mountain is flawed. “They have not demonstrated anything yet. They have raised some legitimate questions, and Nye County has never said, ‘let’s not hear those questions,’” Voegele said. Instead, he called for a debate on the project’s science. “I can’t say it any plainer, let’s do the hearings,” Voegele said. In 2011, Yucca Mountain was dismantled by the Obama administration at the urgining of then-Sen. Harry Reid. Congress hasn’t appropriated any money for the Department of Energy’s Yucca Mountain activities since 2011. The Nuclear Regulatory Commission’s licensing procedure was subsequently suspended because of lack of funds and restarted in 2013 after the D.C. Circuit Court of Appeals ordered the Nuclear Regulatory Commission to resume its review. Yucca Mountain was presumed dead until the Trump administration requested $150 million for fiscal year 2018 to restart the Department of Energy Yucca Mountain program and the Nuclear Regulatory Commission’s licensing proceeding. The move was widely opposed by most Nevada politicians from both parties who pledged to fight the project. In May, the Nevada Senate Finance and Assembly Ways and Means committees approved a two-year $3.8 million budget for the Agency for Nuclear Projects, the top state agency charged with fighting Yucca Mountain. The Nevada attorney general’s office budget includes $3.4 million over two years to fight the project. In addition, state of Nevada officials said they plan to file new contentions to the project. “Their approach has always been to throw as much against the wall as they can to delay as long as possible, and they make no bones about the fact that their job is to kill the program and delay the program, it’s not to do the science,” Lacy said. About 77,000 tons of commercial spent nuclear fuel are currently stranded at nuclear reactors across the country, more than the legal limit that would be allowed to be stored in Yucca Mountain. Nye County officials said that the mountain can “safely store” a larger amount. Ninety-eight percent of the land in Nye County is owned by the federal government, and county officials see Yucca Mountain bringing jobs and stimulating the economy as a way to compensate for that. “The state now could be negotiating a better deal for us instead of just trying to obstruct all the way along, and eventually, the science is heard, it’s proven safe and then, the state goes, ‘we’d like to have it and then we go, forget you!’” Schinhofen said.